If you have never been to Wisconsin, you should. I know that sounds selfish and everything, but Wisconsin is so awesome for about 5 months out of the year. I say that from an outsiders viewpoint, but being from Wisconsin, it is fairly OK, the remaining 7 months if you can survive the cold and often times harsh winter months. But during the summer months, grilling brats are a big deal. I’ve known people to say ‘I ate so many brats this past weekend that I can’t even think of eating another brat’. Brats as we know them, or bratwurst are a big deal when it comes to grilling in the summer months, and it is almost as stereotypical as it is the cheese curd or beer association for this state, and we are all OK with that. With that said, I’ll admit, I love the bratwurst. A few establishments around the city are twisting up versions of brats whether that be Philly cheesesteak brats, or chicken and feta brats. There is one brat that I totally love, and that is the habanero and cheddar brat. When grilled, it has the perfect heat, and with that said, I decided to slice a couple of them up and top them on a pizza. It was freaking killer. Now if you cannot find a habanero cheddar brat, try and find a jalapeño and cheddar brat as they are equally as good, but the habanero packs in a bit more heat, with I love. I’ve been playing around with pizza dough for some time now. It feels like years, trust me, it does. I think I’ve found my go to pizza dough now as I have been using my Kettle Pizza, and my pizzas are turning out fairly well. They still need work, but I’m coming close to a great dough. Regardless, use or make your favorite pizza dough. If you do not have a Kettle Pizza, preheat your oven to 500 degrees with a pizza stone inside. 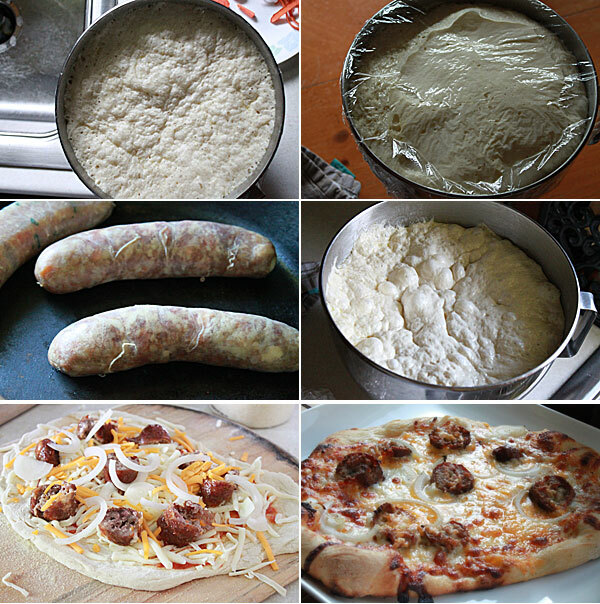 Toss and shape your pizza dough, then add the pizza sauce, just a thin amount. If you want more sauce, go for it. Top with the cheeses, and the sliced brats. Shower the top with the sliced onions. Add the pizza to the preheated stone. I used a pizza wheel for this, lightly coated with semolina or fine cornmeal so it slides right onto the stone. Cook in the oven for about 15-20 minutes or until the crust is nice and cooked, and the cheese is nicely melted. 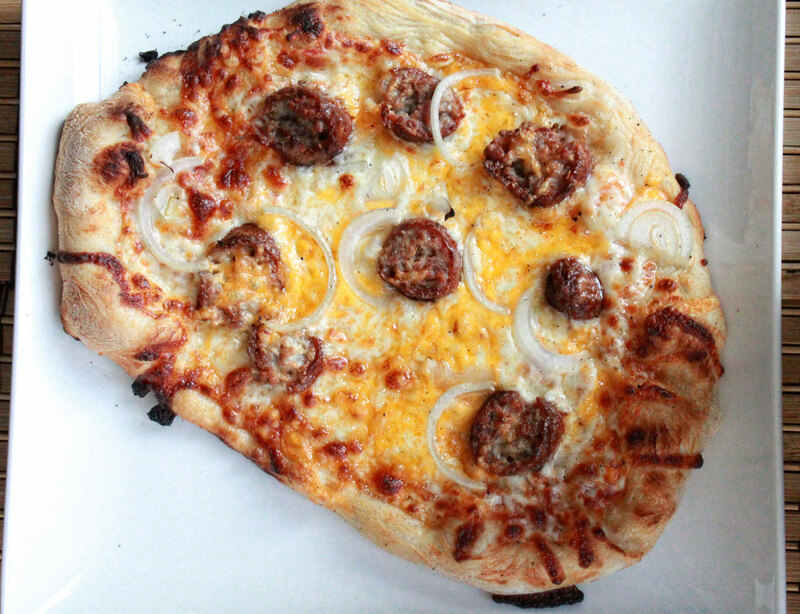 If you are using a Kettle Pizza, well that is done in about 5 minutes (hence why I love that thing). The result is everything you love in a pizza. Heck, I could even just go with the cheese and onion pizza, but the addition of the habanero cheddar brat just set this thing over the top. You think it might be a regular Italian sausage until you get that great heat from the habanero. It’s not too hot in heat, it’s just perfect and makes this pizza possibly one of my favorites. If you are looking for something different to put on your pizza, give this one a shot. It’s a winner in my book. Hope you enjoy, and hope you give the brats a try, especially when visiting Wisconsin!